While trying to debug a High Voltage Parallel Programming experiment and trying to get an idea of the state of the 15 or so signals involved, I decided I had outgrown the ability of my Bus Pirate (which works quite nicely as a logic analyzer, but is limited to 5 channels, 4096 samples at 1MHz, and very simple triggers). 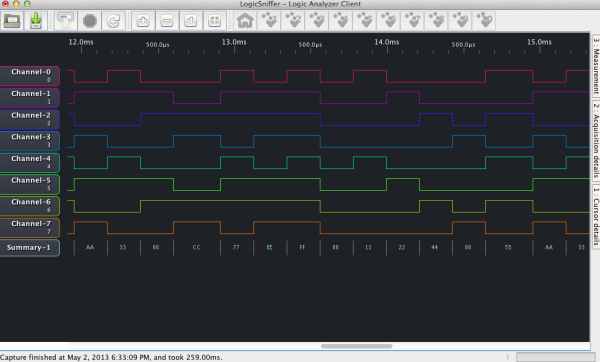 I decided on an Open Bench Logic Sniffer, made by the same people as the Bus Pirate, and working with the same logic analyzer clients. This entry was posted on Wednesday, September 4th, 2013 at 11:00 am	and is filed under Logic Sniffer. You can follow any responses to this entry through the RSS 2.0 feed. You can skip to the end and leave a response. Pinging is currently not allowed. Dude, that’s what I really wanted!! Awesome! !